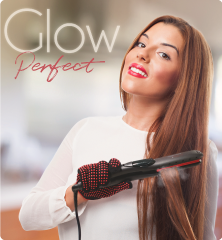 Product photoshoot for our client who sells hair straighteners was done with a model in lifestyle theme. We decided to capture photos by depicting its real-life usage using a female model so it will attract more buyers and results in better conversion. Also, studio background setup was utilized to make the product more viewable with attractive retouch and editing works by using gold wrap elements to give more royalty.